Bingo Caller - Computer assisted 75 or 90 ball Bingo game caller software with flashboard display. DISPLAY THE BALL CALLED TO YOUR PATRONS ? Is your caller tired after calling your BINGO event? 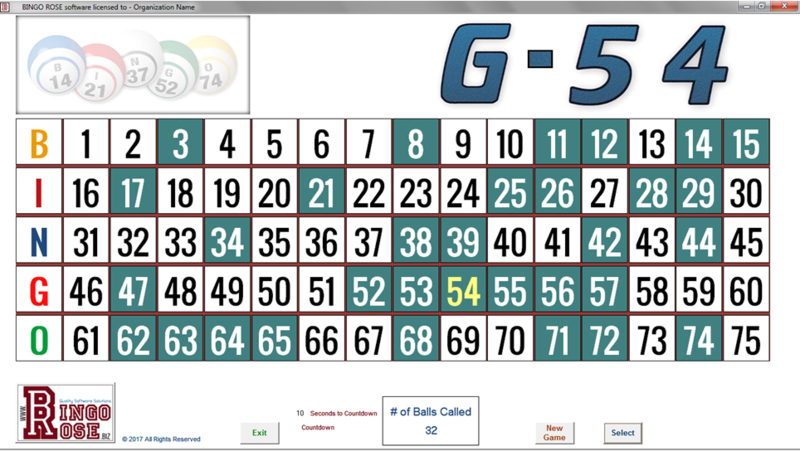 Do you have a need to effectively display the progress of each (75 or 90 ball) BINGO game ? If you have a Windows laptop (minimum screen resolution of 1366 X 768 px) and a large screen TV, the Bingo Caller software is the solution to those needs . . . and more ! This software has features and a price point between our Bingo Flashboard (Basic) software and the comprehensive Bingo Hall Plus software solution to any Bingo lover's needs. Add flexibility and functionality to your quest for a BINGO caller solution. 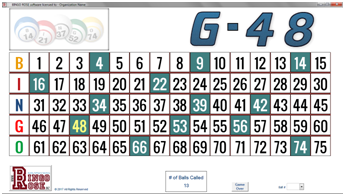 By connecting a computer running the Bingo Caller program to a TV monitor or projector, you can eliminate the high cost of other available solutions. As well, the Bingo Caller program running in Auto mode will randomly generate the game balls which will eliminate the need for expensive and noisy ball blowers or unsophisticated other means of generating the number to call. We eliminate the need to purchase expensive, single purpose BINGO equipment. 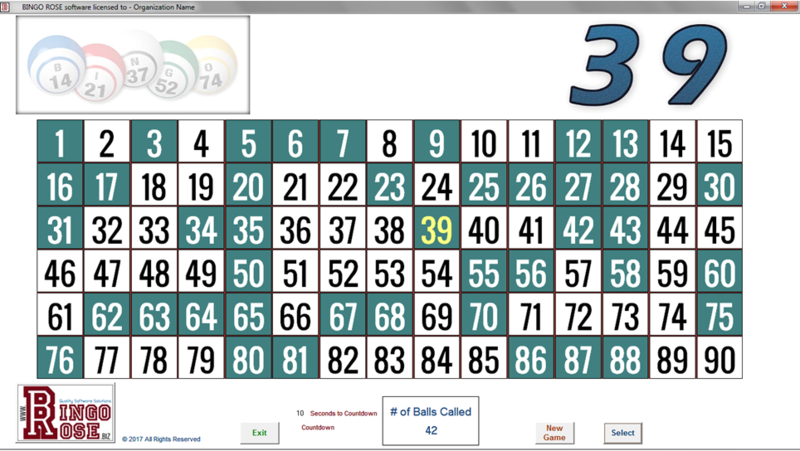 The Bingo Caller software features an uncluttered and visually appealing screen layout with a prominent last ball called display at the top right of the screen. You can operate in either Auto or Manual mode, with either the North American style 75 ball or British style 90 ball display. Used in Auto mode, the unique Bingo Caller randomly generated ball sequence eliminates the need for a ball blower, creating a peaceful / tranquil environment to enjoy the game. Manual mode allows you to take advantage of the many other program features when use with visible balls is mandated. The pre-programmed ball caller voice (female) reduces caller fatigue and assists patrons by providing a consistent sound they can become familiar with. The caller can always suppliment that call if they choose. The Silent mode allows the caller to call the game without interference. The customizable ball caller files are located external to the program. With the aid of a sound editor program (readily available for free download on the Internet), each ball file can be recreated in a different voice, language, or calling style, making this program truly your own. For even more customization, the last number called is designed to employ image files located external to the program in the C:\Bingo Caller\Numbers directory. Modify those files (while maintaining the file dimensions) to give your software a unique look. The software main screen also allows for display of your own Corporate logo. The corporate logo at the top left of the main screen hides the Wild Row feature. Modify the corplogo.jpg file in the C:\Bingo Caller\Numbers directory to make the software look proprietary. Bingo Rose programs are built on a technologically modern platform - Microsoft Office Access 2007. There is no need to have MS Access installed on your computer as the installation routine includes an Access 2007 runtime environment installation (enough of the Access program to run the Bingo Caller program). 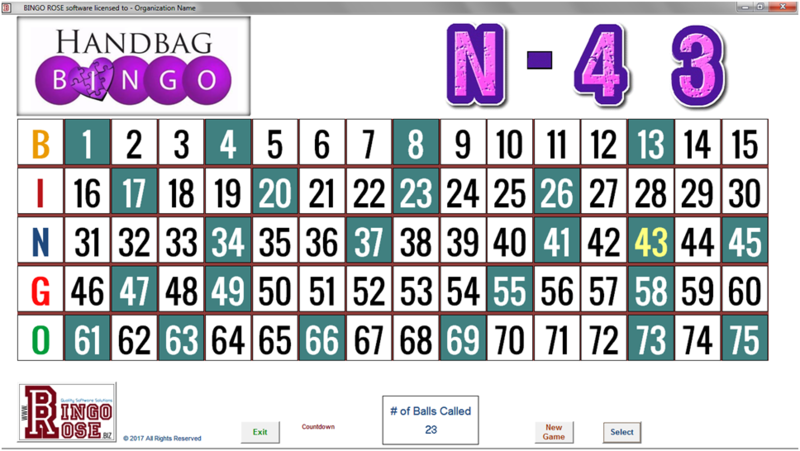 The Bingo Caller program has been designed to maximize screen clarity and therefore computers running the software MUST be capable of a minimum 1366 X 768 screen resolution. Bingo Caller is licensed for single organization use. The Organization Name must be provided at time of purchase. The same Organization Name must be used in conjunction with a License number when the program is first used to register the licensee and record the Organization Name for display on the top banner of the main screen. The Bingo Caller main screen is organized to maximize its viewability by the Bingo patron. Controls used by the caller are functionally placed and inconspicuous to the patron. Controls not required at a particular stage of the game are invisible to avoid distraction. Major program features are set on the Setup Switchboard prior to play. Bingo patrons will appreciate the uncluttered and easily read displays, particularly the large 3D ball called display. (The letters / numbers in this display are produced from image files external to the software. As such they can be modified to suit the users preference.) And when the Auto mode and Sound features are utilized, the caller will appreciate the effortless nature of calling the Bingo game. The dash between the letter and number on the 75 ball screen can be modified to meet the design of your desired letter / number look. You can also make it disappear entirely by modifying the dash.jpg file to be blank. You can make the software look proprietary by modifying the letter and number files and the corporate logo file. Functional controls are discreetly located on the Bingo Caller main screen for use by the caller, yet they don't interfere with the patron's appreciation of the screen details. The Setup Switchboard is where program functionality is mainly controlled. The Bingo Caller program requires little setup. The setup features are accessible from the Setup Switchboard. The main control on the Setup Switchboard is the Auto Mode checkbox which allows the caller to select how the program will control the progress of the game. With a check mark in that box, the program will automatically produce the ball delivery for the game by using our unique random ball selection process. Auto mode works in conjunction with the sound and timer features to maximize the value of the program. Once the current game is started, a “randomly selected” ball will be called. (Test trials of our unique random number generator simulating 20,000 games played revealed that there were no repeat sequences of the 75 balls called during a game! This makes it virtually impossible for a player to predetermine the outcome of any game.) This ball number will be prominently displayed and a sound file will be activated that will call the ball (or no sound if Silent Mode is selected). The timer will countdown to zero at which time (unless the game is halted) the next ball call will be initiated. The Seconds to Countdown default setting is 10 seconds, but it is adjustable to suit your needs by changing its value on the Setup Switchboard to the required seconds interval. In Auto mode, the balls are “randomly selected” and the main screen numbers cannot be selected. Manual mode (Auto Mode deselected) necessitates a ball blower or cage be used to generate the numbers. The drawn number can then be highlighted, and the associated sound file activated, by clicking the appropriate image on the flashboard portion of the screen or by keyboard entry using the Ball # input box. In all modes, as a ball is selected, the appropriate number square on the Bingo flashboard will be highlighted, the numbering will display in yellow, and if Silent Mode is unchecked, a voice file will be activated that will call the ball drawn. A large display of the current ball number is prominently displayed in the upper right of the screen. When the next ball is selected, the number square numbering of the last ball called will switch to white. 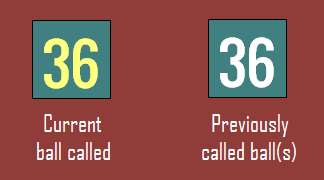 Balls called are highlighted with different colours. In Manual mode, once a ball is selected from your ball system, the drawn ball can be highlighted, a prominent display of that ball number shown, and activation of a sound file that will call the ball, can be effected in two ways. At any time in Manual Mode, you can click on the appropriate image for the drawn ball on the main flashboard screen. You can also use the keypad to enter the ball number drawn from your ball delivery system (drum). If Keyboard Input is checked (Setup Switchboard), the Ball # box is visible on the lower right side of the main screen in which you enter the ball number to be called. Ball numbers drawn can be manually input. Note that if you select the Keyboard Input checkbox while there is a check mark in the Auto Mode checkbox, you will receive a warning to deselect the check mark in the Auto Mode checkbox first as keyboard entry is not available in Auto Mode. Note also that if you have a check mark in the Keyboard Input checkbox, selecting the Auto Mode checkbox will deselect the check mark in the Keyboard Input checkbox. The last number blink feature is new in this version. With this feature activated, the last number called will blink for a short period of time depending upon the Seconds to Countdown value you are using. If the caller accidentally selects the wrong ball (Manual Mode only), that error can be corrected by double-clicking the last ball number square (lettering is in yellow). This will remove any highlighting for the wrongly selected number, clear the last ball called display, and reset the # of Balls Called counter display. Note that this may not be advantageous if you are not running in Silent mode whereby the number will have been called by the program (and once called it is normally considered official). Occasionally a pattern is selected that does not use all of the numbers, such as the Letter H whereby there are no Ns. By double-clicking on the corporate logo area at the top left of the screen, the Wild features under that logo will be made visible (75 ball Bingo only). In the case of the Letter H pattern, a check mark would be added to the N checkbox and the Wild Row button selected. This would mark all Ns as having been called, and therefore will not be called again prior to a New Game. If the game is continued without selecting the Wild Row button, no wild row updates will be processed, even if there are checks in any of the checkboxes. As the game progresses, the # of Balls Called counter display is updated. The Female voice, created by a professional voice-over artist, announces each ball called. The 75 ball game is announced twice while the 90 ball game announces the number once. If the Silent Mode checkbox is checked on the Setup Switchboard, the program does not announce the ball selected. Regardless of the mode selected, the caller still has the option of adding commentary to compliment the programmed voice. The Bingo Caller software is licensed for the enjoyment and sole use of a single organization. An Organization name must be provided at time of purchase. A License number will be provided that is unique to that organization. The provided Organization name and the License number listed in the email you will receive following purchase must be entered exactly as indicated in the email to gain access to the software when it is first run. Incorrect entries may result in the software terminating, necessitating re-launch of the software to access this License form. The Organization name will appear on the top banner of the main Bingo Caller screen. About Bingo Rose splash screen. This screen provides information about your computer and the environment that Bingo Rose is operating in. This information might assist Bingo Rose personnel in troubleshooting any unlikely difficulties you experience with the program. NOTE: Please consult local laws before using this program for other than Not for Profit use. Each time the software is launched, a Licensed User notification will appear. 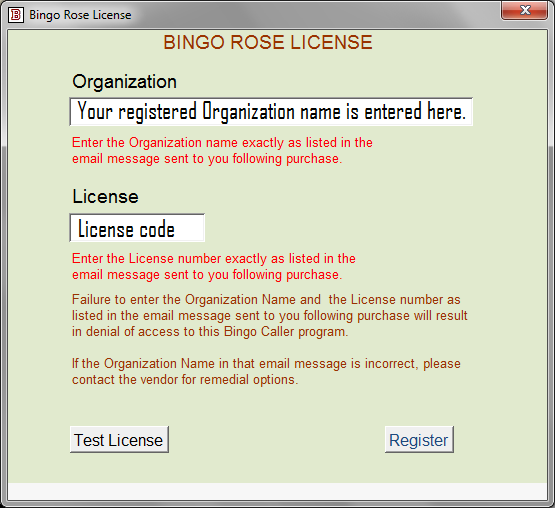 To review your license information, you can access the Bingo Rose License form from the Setup Switchboard by double-clicking the Bingo Rose logo. 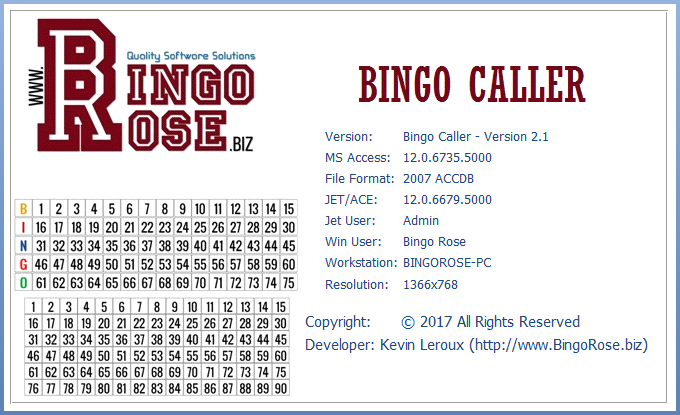 The Bingo Caller software is designed for operation using the Access 2007 version of the Microsoft Access program. Occasionally a user will activate a newer version of this software on their computer which will result in our software opening in that version. A warning message to this effect will display when our software is launched. Unpredictable errors might result if the software operates in this environment. Please contact Bingo Rose for information about how to modify your launch icon so that the Bingo Caller software is forced to open with the required Access 2007 version. To provide this professional Bingo flashboard / caller software program in this price range, it is available as Download only. 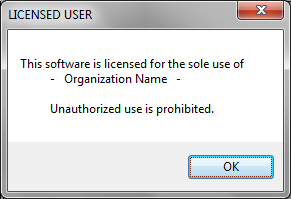 Please provide the Organization Name for which you wish to register this software license. if you need any further information about the use of our products. We are committed to providing the best customer service possible. Bingo Rose - Happy customers on six continents . . . Ask us a question about Bingo Rose software ! Tell a friend about Bingo Rose software !